In 1991, Design Coalition held a series of workshops to introduce cohousing to the Dane County area. Three core groups formed immediately. One group kept going strong, 'The Village' Cohousing group. After almost nine years of meetings and changes in membership, after looking at scores of sites, they purchased an urban site in Madison, half a city block bounded by St. James Court, Mills Street and Mound Street. The neighborhood is a lively older Madison area with a mix of students and homeowners. It is close to the UW-Madison campus, bus lines, hospital and downtown offices. In 1997 the group began moving forward in earnest, working with Design Coalition architects to design the project, get city approvals, contract with housing consultant Steve Silverberg and builder Krupp Construction, and begin building. Now, they're finally moved in. Above: View into the courtyard with the Common House in the center. Above: Early 1990's planning meeting. 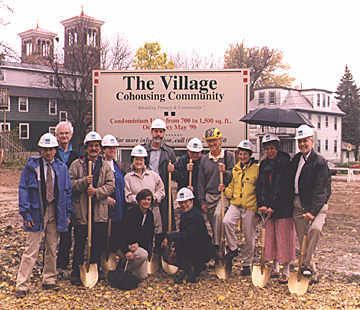 Above: 'The Village' core group on Groundbreaking Day in Autum of 1998. For more information about cohousing, visit The Cohousing Network's national website.